Todds, Murchies, Eatons, Trimbles, etc. although the structure is much altered due to several fires. various locations, the brick building owned and partly occupied by H.
remember lobsters especially, by a committee of which Charles A. And too, the view or picture we see from our windows has all changed. quite a change from the good old days. Trimble Bros Shoe Store where John and his brother sold shoes for many decades. 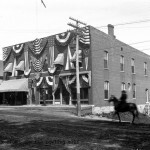 They also had a shoe factory where the EMEC garage is in back of Customs but this burned in 1914. 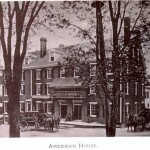 The American House, now the Masonic Hall, on the Avenue where the Club plan was hatched in 1896. 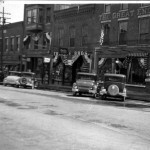 The St Croix Club in the early years- no cars, buses or beer trucks in evidence. 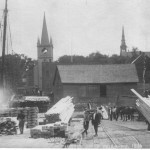 The Eaton Long Wharf, which could be seen from the window of the billiards room, was directly behind the club. The Baptist and Congregational Church steeples can be seen as can the rear of the Club building and window of the billiards room mentioned by John Trimble. 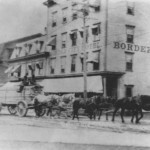 A six horse team hauling cut lumber from the Milltown mills to the Eaton long wharf for shipment to the far corners of the world or at least to the Caribbean where rum, molasses and sugar filled the holds for the return journey. John Trimble regretted the passing of this mode of transport, he refused to own a car but was one of the first in town to buy a bicycle. 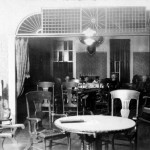 An interior view of the St. Croix Club. 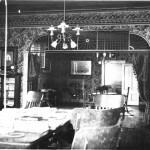 An interior view of the St. Croix Club, showing the reading room. 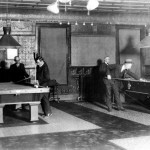 An interior view of the St. Croix Club from 1904. 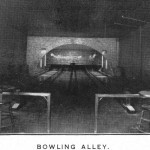 An interior view of the St. Croix Club, showing the bowling alley.